Rating: 4.0 of 5. 1 vote(s). Click the rating bar to rate this item. 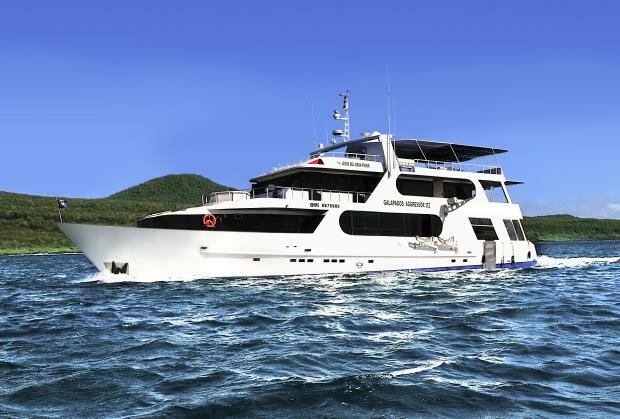 The 100 feet / 32 meter long and 1994 built M/V Galapagos Aggressor III is a luxury diving liveaboard vessel and offers all year dive expeditions to the Galapagos islands, including the top spots Wolf and Darwin. 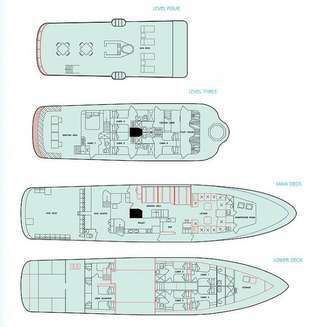 Continous refits guarantee high level standards provided by the Aggressor fleet. 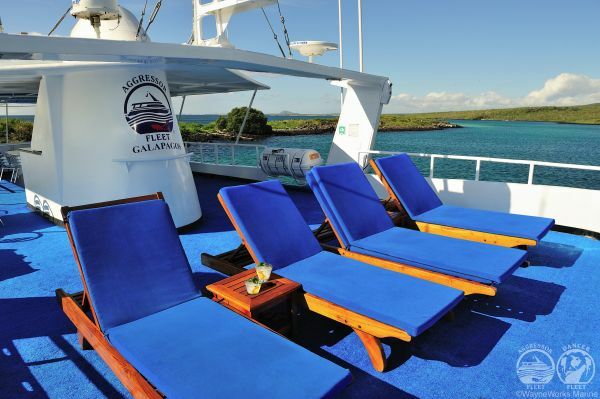 The Galapagos dive trips offer up to 19 dives, 2 night dives and 2 land visits. 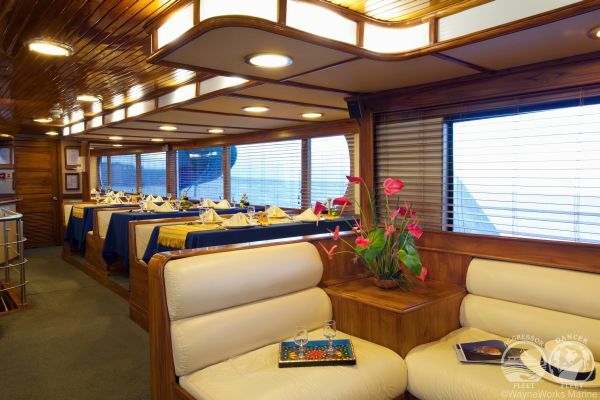 For accomodations 8 spacious and comfortable Staterooms offer space for 16 divers. Divers can enjoy a large partially covered sun deck with deck chairs, tables and loungers, hammocks, CD Player, BBQ and wet bar. The hot tube jacuzzi is the perfect place to relax and enjoy the fresh ocean air. 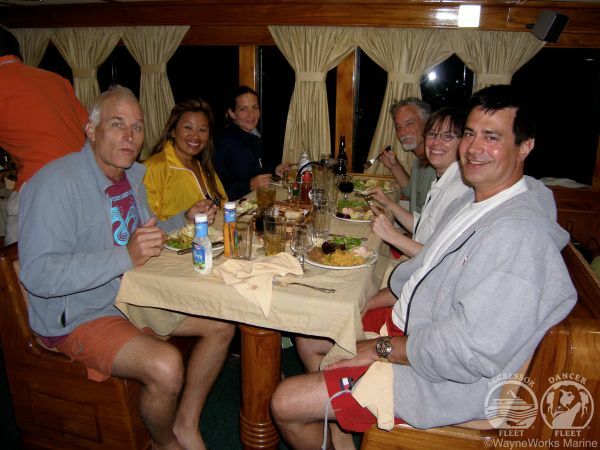 The menu aboard of Galapagos Aggressor is varied and plentiful including American fare and local cuisine. Breakfast (cooked to order), buffet lunch and an elegant chef prepared meal at dinner with tableside service are served in addition to fresh mid-morning and mid-afternoon snacks. Beverages (alcoholic and non-alcoholic) are complimentary while onboard. A well equipped Digital Foto facility with PC for foto download and a UW Foto professional for coaching are available on board. 2 types of double cabins with privat bath are available; 4 Master Staterooms 5 - 8 located at level 3 (above main deck and below sun deck) and 4 Deluxe Staterooms 1-4 located at the lower deck. 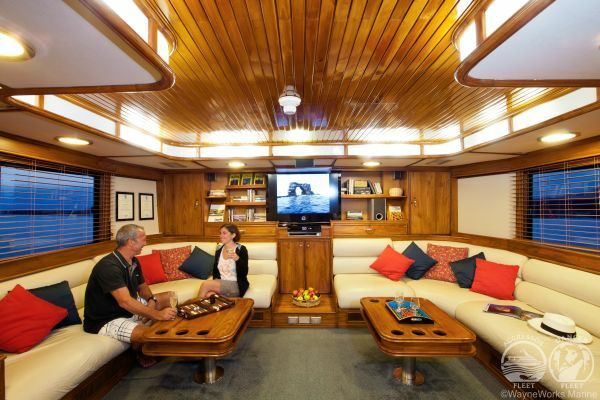 All staterooms are air conditioned and fitted with closet, port window, individual A/C control, TV/DVD, private toilets, showers, sinks, and hair dryers. Linens are changed mid-week and fresh towels are placed in each stateroom as needed. Each with two lower single beds (side by side) with private head and shower, individual climate control and monitor with media player and hair dryer. Staterooms #3 and #4 can be made into a queen bed. 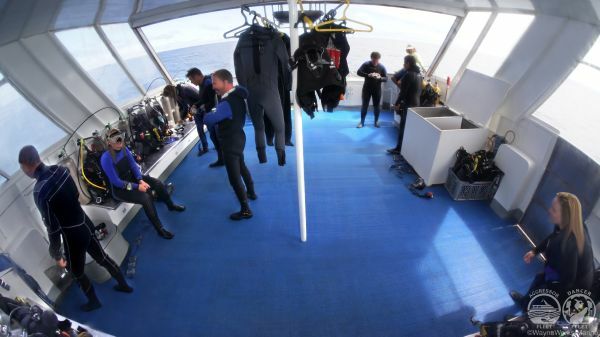 The spacious dive deck on Galapagos Aggressor features personal gear lockers, freshwater showers, rinse tank, and camera table. Photo and video: Complete digital photo facility available including PC for Photo download. Free photo coaching. Strobe charging station and large camera table available for your camera and video gear. Please bring your own battery chargers. 2 Bauer air/nitrox compressors - Nitrox Filtration System. The Galapagos Agressor dive expedition start and end in Baltra and the duration is generally 7 days from Thursday to Thursday. Additional dive sites have been added to the expedition itinerary: Bartolome Punta, Cousins Rock and Cabo Douglas. Friday: 2 dives in the morning; Punta Carrion (Santa Cruz Island) and Bartolome Punta. 1 afternoon dive at Bartolome Punta and land excursion, the guests will hike to the Bartolome Summit. Saturday: 5 Dives at Wolf; 2 morning, 2 afternoon and 1 night dive. Sunday: January to May: 2 morning dives at Darwin and 2 afternoon dives at Wolf. June to December: 5 dives at Darwin; 2 morning, 2 afternoon and 1 night dive. 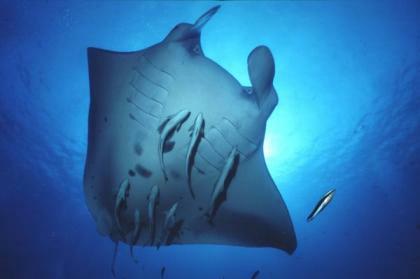 Monday: January to May: 5 dives at Cabo Marshall; 2 morning dives, 2 afternoon and 1 night dive. June to December: 2 morning dives at Darwin; 2 afternoon dives at Wolf. Tuesday: 2 morning dives at Cabo Douglas and 2 afternoon dives at Punta Vicente Roca. Wednesday: 1 morning dive at Cousins Rock. Wednesday afternoon the Galapagos Aggressor will arrive at Itabaca Channel. After lunch guests will disembark at 1 pm to go ashore for a private bus tour to see the beautiful Highlands of Santa Cruz Island. This will include Los Gemelos (The Twins, two enormous sinkholes), Scalesia Forest for a scenic view over Santa Cruz, a Tortoise Reserve to see giant tortoises, and Lava Tubes. After the hike, guests can walk through town, shop and visit the tortoise-breeding center Fausto Llerena at the Charles Darwin Research Station. Guests will have dinner ashore at a local restaurant of their choice (only meal not included in the cruise). 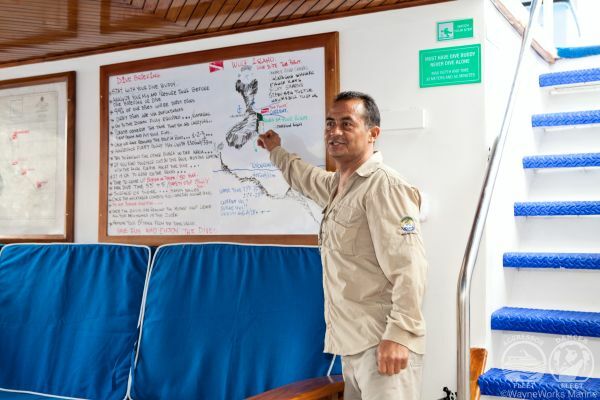 The Galapagos Aggressor will move from Itabaca Channel to Puerto Ayora. At 10 pm, the boats will depart for Baltra. Thursday: Guests will have a full breakfast then check out and depart to the Baltra Airport. Guests have to fly to Baltra. The following information pertains to flights scheduled through Aggressor Fleet on charter embark and disembark dates. We highly recommend staying overnight in Guayaquil (instead of Quito) before flying to Baltra, Galapagos as the flight schedule allows you more time for check-in at the airport, lower priced domestic ticket, later flight than Quito, and the Galapagos Aggressors local office is located in Guayaquil. Your pre-payment to Underseaventures or the Aggressor Fleet confirms your tickets. Checked luggage 32 kilos (70 pounds) Carry on 10 kilos (22 pounds) if tickets are purchased through Underseaventures or Aggressor Fleet. Excess weight charge is 1% per kilo (approximately USD 2.50 per kilo) of the ticket value. Prices per person return flights vary depending on season between USD 496 and USD 608, please contact us for more information. The Galapagos Aggressor accepts cash, traveler’s checks, Visa, MasterCard, and American Express. Personal checks or Discover cards are not accepted. Ships Boutique on board available.